Three years ago, I wrote about my fourth great-aunt Lucinda Dornon and her disappearance from the record trail (see Lost Lucinda: Like Father Like Daughter). A lot can happen in three years. 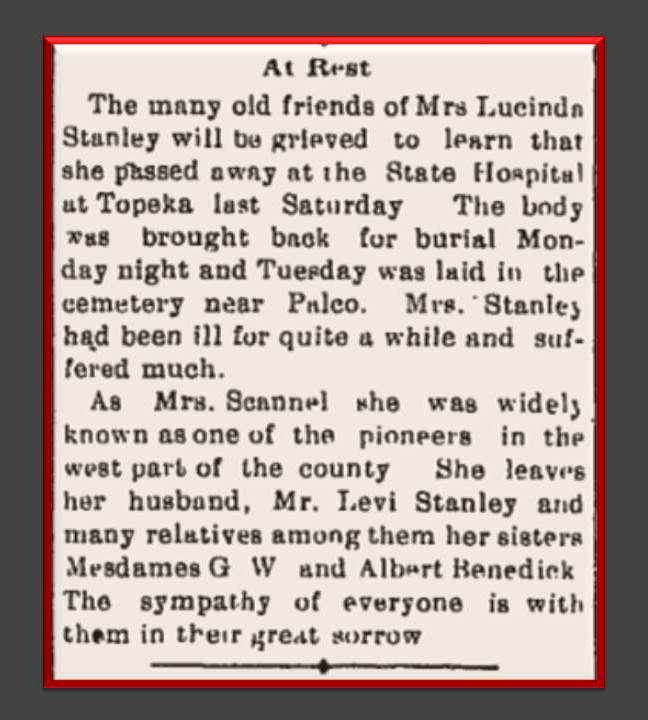 Newly digitized newspaper collections and improved Optical Character Recognition (OCR) have shed more light on Lucinda's tragic story. Lucinda was the youngest child of my fourth great-grandparents Burr Zelah and Sophronia (Rogers) Dornon. I've been researching Burr Zelah for years, trying to learn about the circumstances of his death during the height of the Civil War. 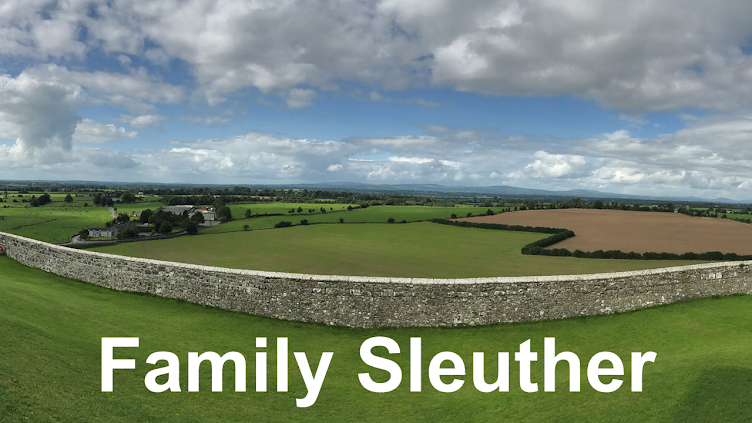 Part of that investigation included an examination of each of his children. Perhaps records they created held answers to his final days. Lucinda was born in Ohio in August 1854 and lost her father before she was ten. With her mother and siblings, she moved to Wyandotte, Kansas, where she married Sylvester Scannel in March 1870. In 1871, they had a daughter named Ella. Ella appeared in the 1880 Federal Census with her parents and again in the 1885 Kansas state census. But then she disappeared. Did she marry or pass away? "...Mr. Scannel was overcome with smoke and heat and fell to the ground. Mr. Lilly dismounted and tried to assist him, but it was too late. The flames came down upon them before they could escape. Mr. Scannel's clothing, except his boots and gloves, was burned entirely off his body, while Mr. Lilly's clothing was nearly all consumed. Both lay upon the ground for nearly three hours, and no one coming to their assistance, they managed to walk by clinging to each other a mile to Mr. Scannel's home, arriving there at 8 o'clock. Mr. Scannel lingered until the morning following, when death relieved him from his terrible suffering. He was conscious to the last and directed all his home affairs before his death." 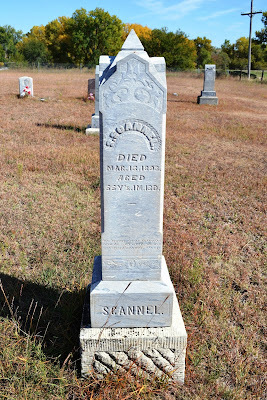 Eighteen years after the fire, The Plainville Times recounted the events of that day and included mention of Scannel's funeral, noting that, "Mr. Scannel had lived in Rooks county for 15 years and was a good neighbor and citizen, and a kind father." That's the last reference to Ella Scannel to have surfaced to-date. Lucinda's life in those years after Sylvester's death must have been difficult. The week after her husband's death, she published a notice in the newspaper advertising that she was auctioning off livestock, likely in dire need of money. The paper's society pages briefly noted a visit to Eaton, Colorado in June, and an extended trip to her sister's in Illinois in October. In June 1899, it seemed that she was finally starting a new chapter of her life when she married Levi Stanley in Gove County, Kansas. The Stanleys settled in Woods County, Oklahoma where they were enumerated in the 1900 census. For three years, this is where Lucinda's story abruptly stopped. It was unclear what happened to her until now. Over the course of four short newspaper blurbs, Lucinda's tragic fate was revealed. 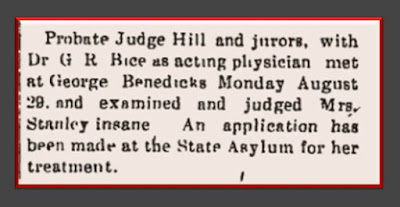 Two weeks later, on September 17, 1904, a Salina, Kansas newspaper reported that Lucinda was taken from Plainville to Topeka's asylum for treatment after her "mind was turned by the suffering caused by Bright's disease." 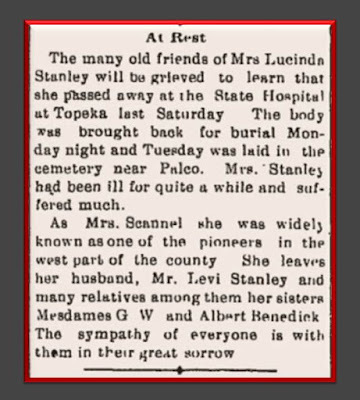 In its September 29, 1904 edition, The Plainville Gazette reported that Lucinda had died exactly one week after traveling to Topeka. No mention was made of a surviving daughter, suggesting that Ella had pre-deceased her mother. A final inferred tragedy. Lucinda was laid to rest in the cemetery near Palco where her first husband, Sylvester Scannel, was buried. A stone pillar rises from the parched land to mark his grave. Lucinda's name was never added to the headstone giving no indication of her final resting place. Her life of tragedy was lost to time but is now remembered and honored. What a sad life Lucinda had - full of tragedy. Her story would have been lost without technology helping you find her. It's very gratifying that technology today enables us to tell stories of people who are forgotten like Lucinda. It's a real honor. Such a sad story. I hope you find out more about Ella. I'm hoping to track down the probate case file that judged Lucinda insane. We'll see what documentation, if any, is included about her family and Ella. 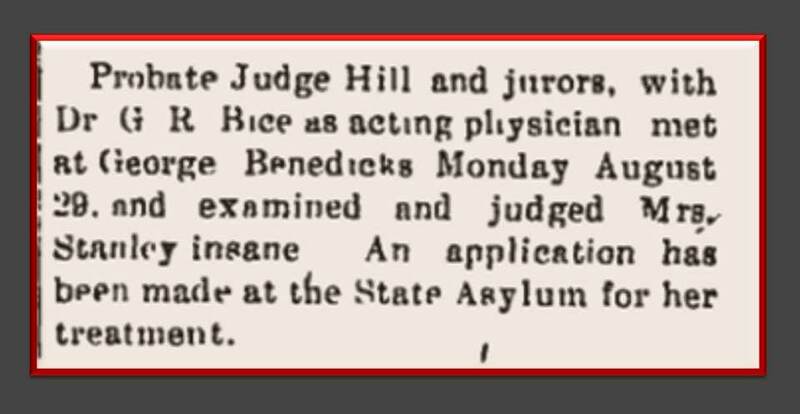 I have a great-aunt who went to the Kansas asylum for the insane and was there all her adult life. I haven't yet found where she was buried. Perhaps there was an article of her passing in the local paper? Or, depending on when she passed, there was a government-issued death record noting burial location? Good luck with your continued search, Virginia, and thank you for visiting.